Republic of Ireland international Stephanie Roche was left cursing a pudding of a pitch that was more typical of her homeland than Florence. Roche moved to Women's Serie A outfit Florentia in November after training with the club for a couple of months. In 2014 she was nominated for FIFA's Puskas Award, making the final three along with James Rodriguez and Robin Van Persie for her incredible effort against Peamount United against Wexford Youths in the Women's National League. She missed out on the prestigious gong then but suffered considerably worse luck in action for the Italians on Sunday. On a soggy, cut-up surface against against Orobica, Roche gathered the ball in the opposition box, steadied herself and struck a low effort goalwards. 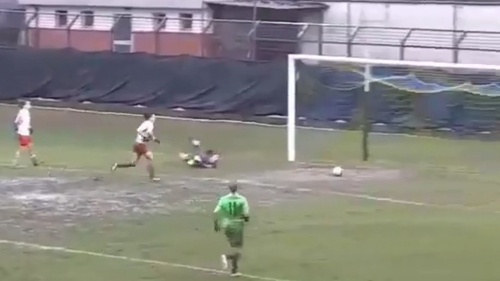 Just as she was about wheel away in celebration, the ball held up in the mud and a defender booted it clear. Roche's misfortune didn't cost her team in the end. Florentia eased to 3-1 win that kept them fifth in the table.